After all, you don’t want to invest in ANY property – you want to invest in the right one! So, here are 4 of the best factors that make up an ideal rental property in Las Vegas and its surrounding area. CARSON CITY, NV – According to the Nevada Department of Employment, Training and Rehabilitation’s (DETR) March 2018 economic report, employment growth remains strong in the Silver State with ongoing increases in employment in all three metropolitan areas. Year-over-year employment also continues to increase in the state as a whole, while statewide unemployment rates continue to fall. Employment data in March continue to show an improving labor market across the state. The fastest employment growth among the state’s metropolitan statistical areas (MSAs) was in Carson City, which grew at a rate of 4.4 percent over the year, while Las Vegas added the most jobs overall with 24,300 more jobs than in March 2017, an increase of 2.5 percent. While the Reno and Carson City MSAs have the fastest growth in the state of late, Las Vegas is the only MSA in the state that has surpassed its pre-recession employment levels, with seasonally adjusted employment reaching a new high of 998,200 jobs in March. . Unemployment rates across the state continue to fall with 11 of 17 counties experiencing a decline over the month and 6 counties experiencing a decline of a half a percentage point or more, said David Schmidt, Chief Economist, for Nevada’s Department of Employment, Training & Rehabilitation. Las Vegas is thriving under a population boom says Jeremy Aguero, a pricipal at Applied Analysis. He said that 4.9 people on average have moved to Las Vegas every hour over the last year. Of those new residents, 34 percent have come from California. These four factors exist in the Las Vegas area and we can help you find them. 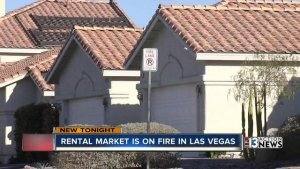 In fact, we’ve got an inventory of properties that meet these and other requirements for what makes a good rental property in Las Vegas… and our clients love working with us because we help them bypass the time and effort required to FIND these properties, since we’ve already done a lot of the legwork. Want to see what rental properties we have available? Click here now and fill out the form or call our office at 702-213-6539 and we’ll be happy to take the time to show you what’s available.